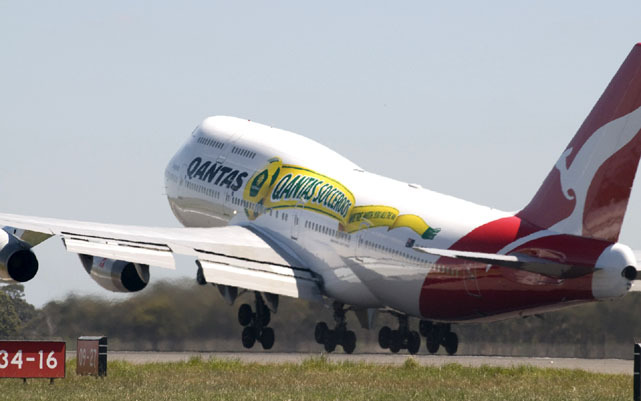 Qantas unveiled a new Socceroos decal on one of its Boeing 747-400s in a ceremony at Melbourne Airport on October 22, ahead of the Socceroos FIFA World Cup campaign in South Africa next year. The Boeing 747 spent a week in the Qantas hangar for the new decal to be applied. It was scheduled to operate QF63 from Sydney to Johannesburg at 11.00am on October 23. 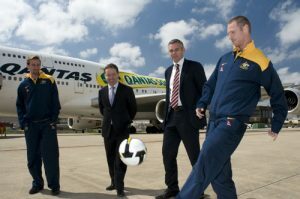 Qantas is the naming rights sponsor of the Socceroos, and has committed its sponsorship out to March 2012. Socceroos Nick Ward and Craig Moore flank Qantas CEO Alan Joyce and Football Federation Australia's Ben Buckley.